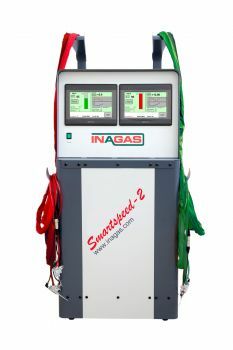 Always at the forefront of gas filling technology to make sealed unit manufacturers’ lives easier, Inagas is pleased to announce the latest addition to its impressive array of machines, the SmartSpeed range. Chris Kemp, Inagas Director says: “As the leading supplier of gas filling solutions, we listen to our customer’s requirements and deliver solutions to make their manufacturing processes easier. The SmartSpeed range is no exception. It’s a single or twin line machine designed for on-line high speed Argon gas filling. The internal IG pressure sensor automatically regulates the variable filling speed between 70-85 litres a minute, per line, to ensure a pressure balanced and accurate gas fill. Features from the Smartfill range such as the SmartStart remote, Data logging and print feature are included as standard. “The 250mm touch screen(s) on the SmartSpeed range shows a live display of the gas filling process and IG pressure. The screen also allows access via a protected pin code entry to the menu screen where settings such as gas fill percentage, data logging, overfill timer, pressure set points and calibration routine can be viewed and adjusted. To ensure a SmartSpeed-1 is future proofed there is also the option to upgrade to SmartSpeed-2 at a later date. Hot off the heels of a successful show in Madrid, Inagas continues its international tour with a presence at Zak Glass in Mumbai from 6th to 9th December.